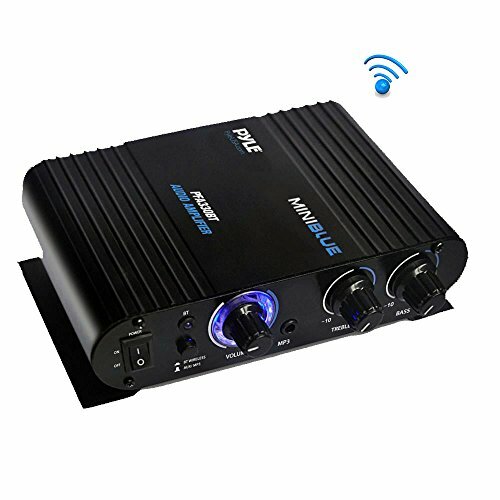 The Pyle PFA330BT is a compact and powerful mini Bluetooth amplifier. This palm-sized high power system features built-in Bluetooth wireless streaming that works with all of your favorite devices (like Smartphones, Tablets, Computers, etc.). It gives you the ability to instantly stream audio from your device's music library and control it all wirelessly. The portable size allows you to conveniently take it from room to room in the house, or bring it along and connect it to your vehicle. It's perfect anywhere you need sound amplifying technology with ultra low distortion levels for acoustically accurate music reproduction. Fine-tune your audio levels of connected external devices with the front panel rotary controls. Additional system features include RCA (L/R) Audio Inputs, 1/4'' Mic Input, Push-Type Speaker Terminals and Aux (3.5mm) Connector. Includes 12V DC adaptor.